A FSA photo of a cropper family chopping the weeds from cotton near White Plains, in Georgia, USA (1941). Sharecropping is a form of agriculture in which a landowner allows a tenant to use the land in return for a share of the crops produced on their portion of land. Sharecropping has a long history and there are a wide range of different situations and types of agreements that have used a form of the system. Some are governed by tradition, and others by law. Legal contract systems such as the Italian mezzadria, the French métayage, the Spanish mediero, or the Islamic system of muqasat, occur widely. 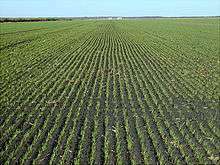 Sharecropping has benefits and costs for both the owners and the tenant. It encourages the cropper to remain on the land, solving the harvest rush problem. At the same time, since the cropper pays in shares of his harvest, owners and croppers share the risks of harvests being large or small and of prices being high or low. Because tenants benefit from larger harvests, they have an incentive to work harder and invest in better methods than in a slave plantation system. However, by dividing the working force into many individual workers, large farms no longer benefit from economies of scale. On the whole, sharecropping was not as economically efficient as the gang agriculture of slave plantations. In the U.S. "tenant" farmers own their own mules and equipment, and "sharecroppers" do not, and thus sharecroppers are poorer and of lower status. Sharecropping occurred extensively in Scotland, Ireland and colonial Africa, and came into wide use in the Southern United States during the Reconstruction era (1865–1877). The South had been devastated by war - planters had ample land but little money for wages or taxes. At the same time, most of the former slaves had labor but no money and no land - they rejected the kind of gang labor that typified slavery. A solution was the sharecropping system focused on cotton, which was the only crop that could generate cash for the croppers, landowners, merchants and the tax collector. Poor white farmers, who previously had done little cotton farming, needed cash as well and became sharecroppers. Use of the sharecropper system has also been identified in England (as the practice of "farming to halves"). It is still used in many rural poor areas today, notably in Pakistan and India. Although there is a perception that sharecropping was exploitative, "evidence from around the world suggests that sharecropping is often a way for differently endowed enterprises to pool resources to mutual benefit, overcoming credit restraints and helping to manage risk." It can have more than a passing similarity to serfdom or indenture, particularly where associated with large debts at a plantation store that effectively tie down the workers and their family to the land. It has therefore been seen as an issue of land reform in contexts such as the Mexican Revolution. However, Nyambara states that Eurocentric historiographical devices such as 'feudalism' or 'slavery' often qualified by weak prefixes like 'semi-' or 'quasi-' are not helpful in understanding the antecedents and functions of sharecropping in Africa. Maggie pointed out that sharecropping was economically inefficient in a free market. However, many outside factors make it efficient. One factor is slave emancipation: sharecropping provided the freed slaves of the USA, Brazil and the late Roman Empire with land access. It is efficient also as a way of escaping inflation, hence its rise in 16th century France and Italy. In the southern United States, the disadvantages of sharecropping soon became apparent. Most sharecroppers and landowners were Baptist, so that ministers had access to candid opinions across the South. It was also harmful to tenants with many cases of high interest rates, unpredictable harvests, and unscrupulous landlords and merchants often keeping tenant farm families severely indebted. The debt was often compounded year on year leaving the cropper vulnerable to intimidation and shortchanging. Nevertheless, it appeared to be inevitable, with no serious alternative unless the croppers left agriculture. In settler colonies of colonial Africa, sharecropping was a feature of the agricultural life. White farmers, who owned most of the land, were frequently unable to work the whole of their farm for lack of capital. They therefore allowed African farmers to work the excess on a sharecropping basis. In South Africa the 1913 Natives' Land Act outlawed the ownership of land by Africans in areas designated for white ownership and effectively reduced the status of most sharecroppers to tenant farmers and then to farm laborers. In the 1960s, generous subsidies to white farmers meant that most farmers could afford to work their entire farms, and sharecropping faded out. Sharecropping became widespread in the South as a response to economic upheaval caused by the end of slavery during and after Reconstruction. Sharecropping was a way for very poor farmers, both White and Black, to earn a living from land owned by someone else. The landowner provided land, housing, tools and seed, and perhaps a mule, and a local merchant provided food and supplies on credit. At harvest time the sharecropper received a share of the crop (from one-third to one-half, with the landowner taking the rest). The cropper used his share to pay off his debt to the merchant. The system started with Blacks when large plantations were subdivided. By the 1880s white farmers also became sharecroppers. 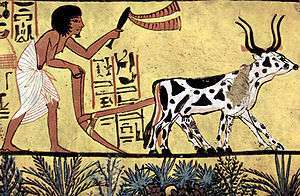 The system was distinct from that of the tenant farmer, who rented the land, provided his own tools and mule, and received half the crop. Landowners provided more supervision to sharecroppers, and less or none to tenant farmers. Sharecropping in the United States probably originated in the Natchez District, roughly centered in Adams County, Mississippi with its county seat, Natchez. 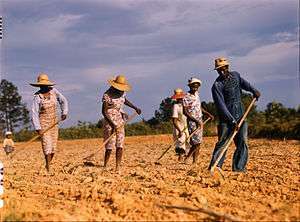 Sharecroppers worked a section of the plantation independently, usually growing cotton, tobacco, rice, sugar and other cash crops and received half of the parcel's output. Following the Civil War of the United States, the South lay in ruins. Plantations and other lands throughout the Southern United States were seized by the federal government and thousands of freed Black slaves known as freedmen, found themselves free, yet without means to support their families. The situation was made more complex due to General William T. Sherman's Special Field Order Number 15, which in January 1865, announced he would temporarily grant newly freed families 40 acres of land on the islands and coastal regions of Georgia. This policy was also referred to as Forty Acres and a Mule. Many believed that this policy would be extended to all former slaves and their families as repayment for their treatment at the end of the war. An alternative path was selected and enforced. Three months later in the summer of 1865, President Andrew Johnson, as one of the first acts of Reconstruction, instead ordered all land under federal control be returned to its previous owners. This meant that plantation and land owners in the South regained their land but lacked a labor force. The solution was to use Sharecropping. It would allow the government to match labor with demand and begin the process of economically rebuilding the nation via labor contracts. In Reconstruction-era United States, sharecropping was one of few options for penniless freedmen to conduct subsistence farming and support themselves and their families. Other solutions included the crop-lien system (where the farmer was extended credit for seed and other supplies by the merchant), a rent labor system (where the former slave rents their land but keeps their entire crop), and the wage system (worker earns a fixed wage, but keeps none of their crop). Sharecropping was by far the most economically efficient, as it provided incentives for workers to produce a bigger harvest. It was a stage beyond simple hired labor, because the sharecropper had an annual contract. During Reconstruction, the federal Freedmen's Bureau ordered the arrangements and wrote and enforced the contracts. After the Civil War, plantation owners had to borrow money to produce crops. Interest rates on these loans were around 15%. The indebtedness of cotton planters increased through the early 1940s, and the average plantation fell into bankruptcy about every twenty years. It is against this backdrop that the wealthiest owners maintained their concentrated ownership of the land. Croppers were assigned a plot of land to work, and in exchange owed the owner a share of the crop at the end of the season, usually one-half. The owner provided the tools and farm animals. Farmers who owned their own mule and plow were at a higher stage and are called tenant farmers; they paid the landowner less, usually only a third of each crop. In both cases the farmer kept the produce of gardens. 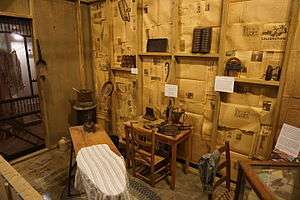 The sharecropper purchased seed, tools and fertilizer, as well as food and clothing, on credit from a local merchant, or sometimes from a plantation store. When the harvest came, the cropper would harvest the whole crop and sell it to the merchant who had extended credit. Purchases and the landowner's share were deducted and the cropper kept the difference—or added to his debt. Though the arrangement protected sharecroppers from the negative effects of a bad crop, many sharecroppers (both black and white) remained quite poor. Arrangements typically gave a third of the crop to the sharecropper. 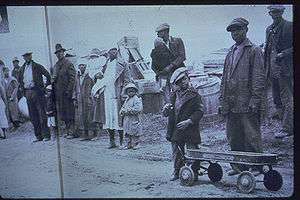 By the early 1930s there were 5.5 million white tenants, sharecroppers, and mixed cropping/laborers in the United States, and 3 million blacks. In Tennessee whites made up two thirds or more of the sharecroppers. In Mississippi, by 1900, 36% of all white farmers were tenants or sharecroppers, while 85 percent of black farmers were. Sharecropping continued to be a significant institution in Tennessee agriculture for more than sixty years after the Civil War, peaking in importance in the early 1930s, when sharecroppers operated approximately one-third of all farm units in the state. Sharecroppers' strikes in Arkansas and the Bootheel of Missouri, the 1939 Missouri Sharecroppers' Strike, were documented in the film Oh Freedom After While. The plight of a sharecropper was addressed in the song Sharecropper's Blues recorded by Charlie Barnet and His Orchestra with vocals by Kay Starr (Decca 24264) in 1944. It was rerecorded and released by Capitol with Starr being backed by the "Dave Cavanaugh Ork" (Capitol Americanna 40051). Decca then reissued the Barnet/Star recording. In the 1930s and 1940s, increasing mechanization virtually brought the institution of sharecropping to an end in the United States. The sharecropping system in the U.S. increased during the Great Depression with the creation of tenant farmers following the failure of many small farms throughout the Dust bowl. Traditional sharecropping declined after mechanization of farm work became economical in the mid-20th century. As a result, many sharecroppers were forced off the farms, and migrated to cities to work in factories, or become migrant workers in the Western United States during World War II. Another arrangement could have the sharecropper delivering the landlord's share of the product to market, in which case the landlord would get his share in the form of the sale proceeds. 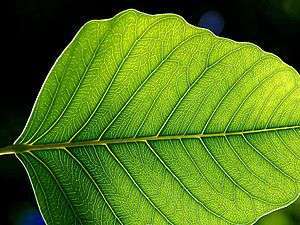 In that case, the agreement should indicate the timing of the delivery to market, which can have a significant effect on the ultimate price of some crops. The market timing decision should probably be decided shortly before harvest, so that the landlord has more complete information about the area's harvest, to determine whether the crop will earn more money immediately after harvest, or whether it should be stored until the price rises. Market timing can entail storage costs and losses to spoilage as well, for some crops. ↑ Larry J. Griffin; Don Harrison Doyle (1995). The South As an American Problem. U. of Georgia Press. p. 168. ↑ Griffiths, Liz Farming to Halves: A New Perspective on an Absurd and Miserable System in Rural History Today, Issue 6:2004 p.5, accessed at British Agricultural History Society, 16 February 2013. ↑ Heath, John & Binswanger, Hans P. (October 1998). "Chapter 3: Policy-Induced Effects of Natural Resource Degradation: The Case of Colombia". In Lutz, Ernest. Agriculture and the Environment: Perspectives on Sustainable Rural Development (PDF). Washington, DC: The World Bank. p. 32. ISBN 0-8213-4249-5. Retrieved 2011-04-01. ↑ Arthur F. Raper and Ira De A. Reid, Sharecroppers All (1941); Gavin Wright, Old South, New South: Revolutions in the Southern Economy since the Civil War (1986). ↑ "Sharecropping | Slavery By Another Name Bento | PBS". Sharecropping | Slavery By Another Name Bento | PBS. ↑ Rufus B. Spain (1967). At Ease in Zion: Social History of Southern Baptists, 1865-1900. p. 130. ↑ Johnny E. Williams (2008). African American Religion and the Civil Rights Movement in Arkansas. Univ. Press of Mississippi. p. 73. ↑ Sharon Monteith, ed. (2013). The Cambridge Companion to the Literature of the American South. Cambridge U.P. p. 94. ↑ Woodman, Harold D. (1995). New South – New Law: The legal foundations of credit and labor relations in the Postbellum agricultural South. Louisiana State University Press. ISBN 0-8071-1941-5. ↑ F. N. Boney (2004-02-06). "Poor Whites". The New Georgia Encyclopedia. Retrieved 2006-05-18. 1 2 Charles Bolton, "Farmers Without Land: The Plight of White Tenant Farmers and Sharecroppers," Mississippi History Now, March 2004. 1 2 3 4 Robert Tracy McKenzie, "Sharecropping," Tennessee Encyclopedia of History and Culture. ↑ Gregorie, Anne King (1954). History of Sumter County, South Carolina, Page 274. Library Board of Sumter County. ↑ Sharecroppers All. Arthur F Raper and Ira De A. Reid. Chapell Hill 1941. The University of North Carolina Press. ↑ Charlie Barnet - Sharecropper's Blues. YouTube. 26 August 2011. ↑ Gordon Marshall, "Sharecropping," Encyclopedia.com, 1998. ↑ Alfred Marshall (1920). Principles of Economics (8th ed.). London: Macmillan and Co., Ltd.
↑ Cheung, Steven N S (1969). "Transaction Costs, Risk Aversion, and the Choice of Contractual Arrangements". Journal of Law & Economics. 12 (1): 23–42. doi:10.1086/466658. Retrieved 2009-06-14. ↑ Formalized in Roumasset, James (1979). "Sharecropping, Production Externalities and the Theory of Contracts". American Journal of Agricultural Economics. 61 (4): 640–647. doi:10.2307/1239911. JSTOR 1239911. ↑ Stiglitz, Joseph (1974). "Incentives and Risk Sharing in Sharecropping". The Review of Economic Studies. 41 (2): 219–255 j. doi:10.2307/2296714. JSTOR 2296714. ↑ Stiglitz, Joseph (1988). "Principal And Agent". Princeton, Woodrow Wilson School – Discussion Paper (12). Retrieved 2009-06-14. ↑ Reid, Jr., Joseph D. (March 1973). "Sharecropping As An Understandable Market Response: The Post-Bellum South". The Journal of Economic History. 33 (1): 106–130. doi:10.1017/S0022050700076476. JSTOR 2117145. ↑ Murrell, Peter (Spring 1983). "The Economics of Sharing: A Transactions Cost Analysis of Contractual Choice in Farming". The Bell Journal of Economics. 14 (1): 283–293. doi:10.2307/3003555. JSTOR 3003555. ↑ Roumasset, James (March 1995). "The nature of the agricultural firm". Journal of Economic Behavior & Organization. 26 (2): 161–177. doi:10.1016/0167-2681(94)00007-2. Retrieved 2009-06-14. ↑ Allen, Douglas W.; Dean Lueck (2004). The Nature of the Farm: Contracts, Risk, and Organization in Agriculture. MIT Press. p. 258. ISBN 9780262511858. ↑ Hallagan, William (1978). "Self-selection by contractual choice and the theory of sharecropping". Bell Journal of Economics. 9 (2): 344–354. doi:10.2307/3003586. JSTOR 3003586. ↑ Allen, Franklin (1982). "On share contracts and screening". Bell Journal of Economics. 13 (2): 541–547. doi:10.2307/3003473. JSTOR 3003473. ↑ Muthoo, Abhinay (1998). "Renegotiation-proof tenurial contracts as screening mechanisms,". Journal of Development Economics. 56: 1–26. doi:10.1016/S0304-3878(98)00050-9. Retrieved 2011-04-22. ↑ Reid, Jr., Joseph D. (1976). "Sharecropping and agricultural uncertainty,". Economic Development and Cultural Change. 24 (3): 549–576. doi:10.1086/450897. JSTOR 1153005. ↑ Eswaran, Mukesh; Ashok Kotwal (1985). "A theory of contractual structure in agriculture,". American Economic Review. 75: 352–367. JSTOR 1814805. ↑ Ghatak, Maitreesh; Priyanka Pandey (2000). "Contract choice in agriculture with joint moral hazard in effort and risk,". Journal of Development Economics. 63 (2): 303–326. doi:10.1016/S0304-3878(00)00116-4. Retrieved 2011-04-22. ↑ Roy, Jaideep; Konstantinos Serfes (2001). "Intertemporal discounting and tenurial contracts,". Journal of Development Economics. 64 (2): 417–436. doi:10.1016/S0304-3878(00)00144-9. Retrieved 2012-09-04. ↑ Sen, Debapriya (2011). "A theory of sharecropping: the role of price behavior and imperfect competition,". Journal of Economic Behavior & Organization. 80 (1): 181–199. doi:10.1016/j.jebo.2011.03.006. Retrieved 2012-09-04. ↑ Shetty, Sudhir (1988). "Limited liability, wealth differences, and the tenancy ladder in agrarian economies,". Journal of Development Economics. 29: 1–22. doi:10.1016/0304-3878(88)90068-5. Retrieved 2011-04-22. ↑ Basu, Kaushik (1992). "Limited liability and the existence of share tenancy,". Journal of Development Economics. 38: 203–220. doi:10.1016/0304-3878(92)90026-6. Retrieved 2011-04-22. ↑ Sengupta, Kunal (1997). "Limited liability, moral hazard and share tenancy,". Journal of Development Economics. 52 (2): 393–407. doi:10.1016/S0304-3878(96)00444-0. Retrieved 2011-04-22. ↑ Ray, Tridip; Nirvikar Singh (2001). "Limited liability, contractual choice and the tenancy ladder,". Journal of Development Economics. 66: 289–303. doi:10.1016/S0304-3878(01)00163-8. Retrieved 2011-04-22. Allen, D. W and D. Lueck. "Contract Choice in Modern Agriculture: Cash Rent versus Cropshare," Journal of Law and Economics, (1992) v. 35, pp. 397–426.